Grandmaster Lee Kam Wing (seventh generation) was born in Hong Kong, 1947. He was introduced to Master Chiu Chi Man by his maternal uncle while he was fifteen years old. 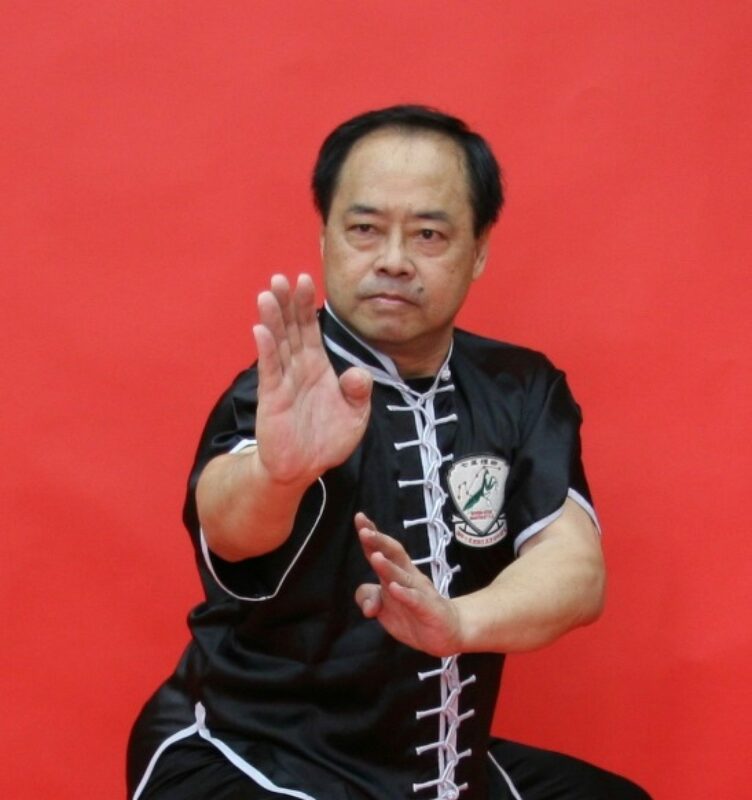 He spent ten years learning the Seven-Star Praying Mantis Style from Master Chiu Chi Man.In 1972, Lee was encouraged by Master Chiu to set up his own Martial Art Association in Hong Kong in order to enhance and glorify the Seven-Star Mantis Style all over the world. Master Chiu also passed on 4 sets of books including the Seven Star Praying Mantis Style practicing series and the practical medical prescription for treatment in osteopathy, as well as a disciple flag to Master Lee as a closed door disciple. Master Lee is now giving lessons of the Seven-Star Praying Mantis Style to his students in Hong Kong and providing treatment in osteopathy for wounded people. With a view to achieve an advanced medical experience in Chinese osteopathy, he has completed a Chinese medical couse in Acupuncture in the Zhaoqing Medical School in Zhaoqing City, China, and he has also completed an advanced course of the Chinese Osteopathy from Doctor Ng Chung Lung who is a graduate from the most famous Fushan Orthopaedics Hospital in the Fushan City in China. Dr. Ng is also a professor with Hong Kong Baptist University. In order to put the real contact of fighting technique of the Seven-Star Praying Mantis Style into practise, Master Lee gives practical training to his students for attending a free fighting competition which is held frequently in Hong Kong. In addition to Master Lee’s emphasis on traditional teaching methods, he also emphasizes practical boxing skills. In 1978, Master Lee had been appointed by the Federation of Chinese Martial Arts as the team leader for the Hong Kong Team for joining the second Chempion Competition held in Taiwan. Moreover, from the 1970s through the 1980s, Master Lee instructed several students to join the free-fighting competition organized by the Federation of Chinese Martial Arts and the Federation of Kung Fu (Hong Kong) and other organizations. Master Lee’s students have obtained the championship of different classes. As a result, Master Lee was recognized as an important contributor to martial arts. Master Lee has been elected as executive director of the Federation of Chinese Martial Arts and Vice Chairman of the Federation of Kung Fu (Hong Kong), Vice Chairman of the International Alliance of Chinese Martial Arts. In 1996, the Hong Kong Police Wushu Club invited Master Lee to be the chief instructor fo the Seven-Star Praying Mantis Style. In July, 2002, Master Lee was invited to act as the chief instructor for the Hong Kong team joining the internation champion competition for traditional Chinese Martial Arts. Master Lee obtained two gold medals for “Stick Method” and Seven-Star Praying Mantis Style. The Hong Kong team obtained excellent results with a total of 15 gold medals and one silver medal. On 5 November 2003, Master Lee expanded to the “Wing Tat Chinese Medicine Center.” In December 2002, Master Lee upgraded to “international Seven-Star Mantis Style Lee Kam Wing Martial Art Association”, showing Master Lee’s great contribution to promoting Master Low Kwong Yu’s Seven-Star Praying Mantis Style in Hong Kong and overseas. On 23 February 2004, several masters of the mantis style and Master Lee set up the Hong Kong Shandong Mantis Boxing Association, with th emission of promoting praying mantis boxing, increasing global exchange of the praying mantis style culture and improving the global development of the praying mantis style. On 28 May 2004, Master Lee was also awarded the Level 9 Degree of World Convention of Wu Shu Kung Fu Masters of Canada, due to his contribution and excellence in promoting Chinese martial arts. Master Lee is now a famous Master for Chinese Martial Arts in the world. There are affiliate organizations established in the United Kingdom, USA, Germany, Italy, Hungary, France and Australia. Master Lee has more than a thousand students. Master Lee has distributed books, video tapes, and compact discs for the Seven-Star Praying Mantis Style.